Lacemaking: a day's tuition with a highly skilled specialist in the home of a Guild member. For all the strong passions lace can evoke, it is a major and very long-standing part of our decorative tradition, and people dedicated to keeping vestments in repair can't afford to ignore it. What the ladies of the Guild have discovered is that it is also a lot of fun to make, if time-consuming, But that is not all they have been doing. 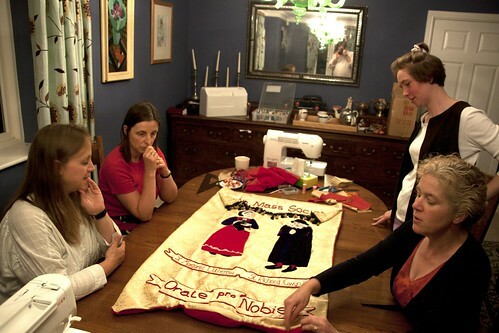 The Guild has organised training opportunities for members in gold-work, silk shading, stumpwork, and embroidery, over the past year, and more are planned. 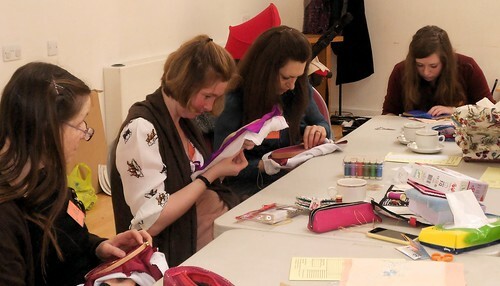 One member is currently doing the Royal School of Needlework's Certificate course, a part-time course which takes in 4 important, traditional needlework techniques, and can lead to their Diploma or Degree courses: two other members are about to begin the Certificate. This is a very exciting time for the Guild, which has three active groups, in London, Oxford and Birmingham, and can accept individual members from all over the country. 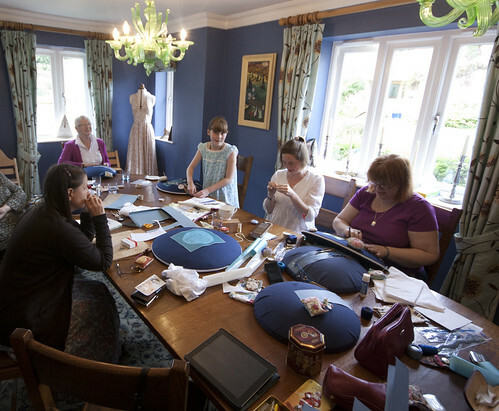 Even without a local group you can take part in the training days, which are inexpensive way to receive expert tuition. The Guild addresses a serious problem in the Church in England and Wales, and no doubt elsewhere: that of good vestments which are falling to pieces, and can only continue in use with some intelligent repair and restoration. When the vestments are of the highest quality and historical importance, then it is worthwhile to send them to professional restorers who will repair them to museum standards and charge you a small fortune. But what if they aren't? To get your attractive and workmanlike, but not especially valuable, vestments back in use, when they are beginning to fray at the edges, you need the sort of highly competent amateur needlecraft resources which would have been take for granted in most parishes fifty years ago, but are now rare. There is a real danger of incompetent repairs which damage the vestment and make further work harder, and one can see these on too many old vestments. Don't just send your worn out vestments to some one in the parish who is 'willing to have a go': get them looked at by someone who has at least been systematically trained in the authentic techniques, even if she isn't a professional. To this end, if you are interested in this important aspect of the Church's patrimony, support the Guild of St Clare. Join them, get involved, make a donation, ask their help. See their website here. You can make a donation through the Latin Mass Society; just specify what it is for. Guild members finishing the Latin Mass Society's banner. Here's what the great Monsignor Basil Loftus had to say, in the Christmas issue of the Catholic Times in 2012, when the milk of human kindness was particularly plentiful in his soul. Liturgical lace is a particular sin. Lace itself was invented in late medieval France as an adornment for the nobility. Young girls went blind as they were forced to work at their bobbins to make it. Perhaps it was inevitable, then, that it should be adopted by the Church, happy to blind young girls whose brothers it had castrated in order to preserve the purity of its liturgical music. Just after Vatican II the Secretariat of State issued an edict that should have got rid of all lace in the liturgy. So, rightly, such inappropriate foliage withered on the liturgical tree. Now, 50 years later, it is being grafted onto it again, in the name of a hermeneutic or interpretation of continuity. A Church which makes itself a laughing-stock can’t object when people increasingly fail to take it seriously. All I can say is: this chap needs help. As a matter of history, lace is at least as associated with Protestantism: Hugenot lace-makers, the fashion for lace among Puritans, the lace-making of the Low Countries and indeed of England (which is said to have been taught to poor English women by Queen Catharine of Aragon, as a means for them to earn money). The kind of lace Loftus has in mind is made with bobbins, not a needle, and isn't particularly hard on the eyes; furthermore, lace-makers developed an ingenious method of focusing light on their work, using a spherical glass vessel filled with water, which enabled them to work after sunset. I don't suppose Loftus reads the fashion pages, but he was writing at a moment when lace was making a huge comeback, outside the Church as well as inside it. In that very year we read on a fashion website, 'This Christmas, fall in love with lace'. Loftus has been ranting about lace being old-fashioned for so long that it has actually ceased to be true. He needs to join Tracey Rowland in the remedial class on contemporary culture.